The Vietnamese Salad looks so inviting. It’s such a bright, fresh change from all the comfort food we northerners seem to make this time of year. I hope Charlie feels better soon! Separate dessert stomach, hah! My kids have said that for years. What a delicious spread of foods! There’s a restaurant here in Santa Cruz where I always order the wasabi salmon. It’s a gorgeous place and I love going there . Your salad looks great . Poor Charley, I hope he feels better soon. Poor Charlie, the cone of shame. Glad he is better. And wow on the restaurant, everything looks so good. And I want a beach (so bad) near me now! Great salad, sounds delightful. Hi Maureen, all the food looked delicious, I could easily have ordered any one of those. Hope Charlie feels better, they all sure hate the cone of shame. Awww…i hope Charlie feels better and get the cone removed soon…he is so cute! The recipe looks delicious…i love how fresh and colorful it looks! Seems that you’ve had a feast :). I’m like Lorraine, there is always a room for dessert :). Poor thing keep an eye on him and I hope he will be ok soon. This restaurant is totally up my ally! I think I’d order the BBQ Seafood Platter!!! Take me there, pleeeeze! Poor Charlie and the cone of shame. Hope the biopsy results come back negative for any bad stuff. Oh poor Charlie, hope he’s feeling much better. And you too. I’ve missed seeing your comments lately. Lordy, that seafood platter looks delicious – I’m very hungry now. Poor Charlie, I hope he gets well soon and has no further problems. Those cones are a hazard. When our Irish wolfhound had to wear one she banged into everything and almost took plaster off corners around the house. Big, big hugs sent to Charlie and DO hope the lipomas were just such! See those cones everywhere: what must the poor animals make of such discomfiture? Yuk!! Absolutely love the Vietnamese salad: everything I stand for in my ‘these days’ eating! Had not realized you could not tolerate seafood: to my way of thinking, what a bummer!! ‘big smile* – did not realize Oysters Kilpatrick was still being served: it seemed such a big deal on the ‘business lunch circuit’ way back when . . . I remember oysters kilpatrick back in the 80s too! Oops! I better not admit to late 60s and 70s 🙂 !! Natural, mornay, Kilpatrick and Bercy, if the restaurant was really ‘smart’ 🙂 ! Hmm, look at the menus now!! Poor Charlie! He looks so unhappy. Hope things will be OK. Anyway, I find red chili improves most foods. 😉 Sounds like a wonderful lunch, and that’s a terrific salad. Thanks. It’s down the river side of Mooloolaba next to where all the fishing trawlers drop off their fish. Near the yacht club too. That salad is speaking to me too – wow! Sounds like a great restaurant and a lovely time with friends! Charlie is so CUTE! I hope he’s doing well! I need that salad ASAP! It looks absolutely delicious! All of those dishes look freaking awesome!!! I’m not sure which one I would have ordered but that Vietnamese Salad is certainly calling my name. Such a beautiful salad and yours looks just like the one you paid for. Gotta give this a try. Poor Charlie. 🙁 Glad he is doing o.k. Awhhh YARM! 🙂 I could go a plate of all the dishes, far out your pictures are super, so great a couple of my colleagues leaned in for a sniff. 🙂 Nawh… Poor Charlie. Fingers crossed for a super speedy recovery. Nothing worse than our animals being crook. First you kill me with this meal. This looks so good and so sunny and then Poor, poor Charlie. I sympathize. When my dogs are feeling down, I feel down. You should have taken him to lunch with you and bought him a steak. My brother always went to restaurants where he could sit outside with his dog, and he always ordered him an unsalted grilled chicken breast, that he would then cut up into little pieces. What can I say? Except I love this salad! I love Thai Asian salad and love how they really pile high the toppings at the restaurant. I am certain you served identical to the restaurant at home… wink wink. I hope you are doing well. Oh, poor, poor, Charlie – but would a brilliant salad – both – will be making this sometime in the near future, when I have a kitchen again! Glad Charlie is doing all right…Furry animal family members are precious…Okay on to the food…How lucky are you to live so close to a spot resembling paradise…The meals at Fish on Parkyn look pretty heavenly too. Ditto for living on that Vietnamese Salad. Quite an honor they divulge any of their ingredients….P.s. The fish and chips makes me want to go to the pub!! Dang Girl, I wish your photos were quite so vivid. I want that food—any of the dishes–NOW! Wonderful post. Hugs to Charlie. Funny about his pee situation. But actually it’s pretty logical. I can’t pee with a cone on either. I didn’t know you lived in Mooloolaba, what a gorgeous place! My husband lived there for awhile and I got to visit with him. So nice! Looks like lovely food, too! 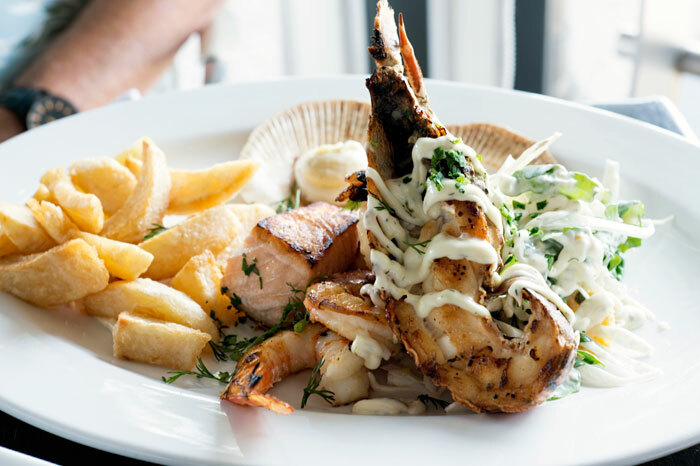 Ooh you can’t beat a seafood platter by the water in my books! What a view! I can understand you Maureen, I could live in this salade as well, it looks wonderful! Oysters are stunning! Poor Charlie, I hope will be ok very soon! Have a nice weekend! That Vietnamese salad looks almost like a Christmas tree- just in time for the season coming up. As for my manners, I would just pick up the platter and lick the port wine sauce directly off the plate. I remember eating at Bob’s Bog Boy restaurant in California in the ’70s and doing just that with their hot fudge cake (and I wouldn’t put it past myself to do the same with the port wine sauce)! Lovely salad Maureen. I’ve been craving good salads lately, despite the constant rain and cold weather here. My body must be needing it. What an amazing array of food!! I love the Vietnamese salad! I would choose that every time I think! So many delicious flavours in there!! I have dined with Lorraine and she really does have a separate dessert space… there is no way I could even have a bite of dessert after a meal like that… I’m so envious of Lorraine hahah! Aw, poor Charlie! They hate when their routines are interrupted. Fingers crossed for good lab results. P.S. I could live off this salad, too! I have never had such a salad, but I want now! Looks like a awesome food place to be. I am getting hungry now. Oh sweet Charlie I hope that he feels better really soon! This looks like an amazing place to eat and that salad looks awesome!! Delicious ! I love all this. I have been thinking about you all day and now I have finally landed here. I for sure have favorites at restaurants. Some places I have tried very little because I can’t move away from the first dish I had and loved. For me that first salad I could also live on but I would have to have some of the oysters too. Everything looks amazing!! This salad is delicious. Not sure how it serves 4 though? I made it tonight for hubby and I and my daughter. Thankfully I didn’t think she would ‘love’ it, so I only gave her a very small portion. There was nothing left in the bowl but a whole lot of juices. Next time I would double the ingredients but keep the same portions for the dressing. Lovely flavour, but just not enough for 4 people. I’m really sorry. We used this salad as a part of a meal and it was enough for us. Please accept my apology, I should have said that. You’re right, the salad does have juice at the bottom and it did at the restaurant too.